to fully support the birthing mother. A labour doula is invited into a couple's most memorable moment: the welcoming of their baby into the world! During this intimate time, the doula strives to enhance the partner's role, by allowing them to participate and become involved at their own comfort level. By doing so, she can help remove unnecessary stress, anxiety and expectations which may be placed upon the partner. By hiring a doula, you're choosing to have an ally present; someone who knows what to expect and what is normal, which can bring a sense of comfort and reassurance to all those present in the room. without having to "know it all". The doula can provide information on position changes as labour progresses, as well as additional suggestions every step of the way. The bond between the birthing woman and her partner can be strengthened by working together as a team. A doula aims to protect your sacred space and help enhance your experience, by facilitating a partner's involvement based on the couple's desire. Many partners-to-be do not possess much experience when it comes to labour and birth. They may not be familiar with the sounds a labouring woman can make, or know when it is appropriate to remain home instead of relocating to the hospital. A doula can also assist when things do not go as planned. Having someone dedicated to remaining by your side and to help you both, no matter how long the journey lasts, is an invaluable experience. How does a doula differ from medical professionals? The role of the doula is quite different than that of a nurse, midwife, physician or obstetrician, as she does not provide any clinical or medicalized care. A doula does not have any other responsibility but to tend to her client's needs. The doula provides continuous emotional and physical support to the couple, throughout labour and birth. She is present from the time the couple summons her, until one to two hours after the baby is born to help with initial breastfeeding. Typically, a midwife won't attend the mother until labour is well established and active, which can take hours or even days, during which time you and your partner are labouring alone. If in hospital, your nurse may have other clients to tend to, and physicians and obstetricians usually arrive only shortly before catching the baby. Doulas and other birth professionals hold very different roles, yet are able to compliment one another, while tending to families in any birth setting. 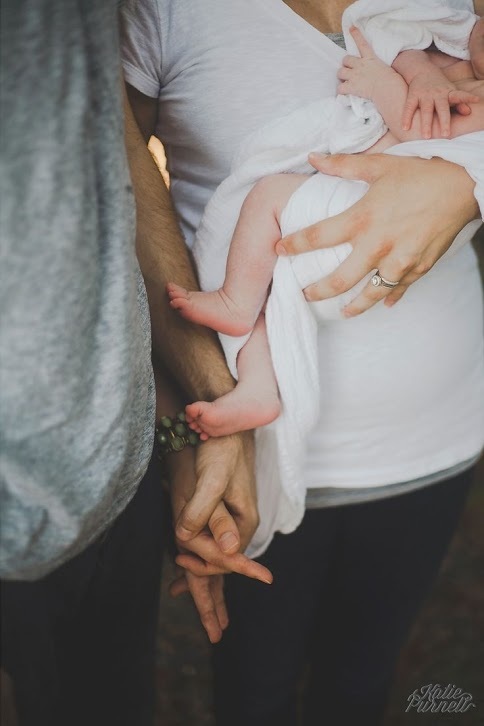 "Here is the real question: can a dad who has done all the reading, who has attended all the classes and who has great communication with his partner completely fulfill the role of an ideal birth companion to his wife? Having been through it, I don't believe it makes sense to go it alone, hire a doula. Dad-to-be, you may be well-meaning and informed, but you are not experienced. If the unexpected happens (and it often will) it's really nice to have someone with experience in your corner. There's not much more of a sinking feeling than realizing that you don't have the knowledge or experience to help your wife when she is in labour and really needs some help and support. is the number of hours you spend without them. Let's face it; you can only learn so much from books and classes. In my wife's case, she had intense back labour for most of the labour and experienced a lot of nasty discomfort for hours and hours on end. Of course, I knew about back labour but there was no way I had enough experience to have been the kind of help that Sonya was. Having experience means you know tricks and techniques that can make a huge difference. Sonya knew what to do and worked tirelessly to massage my wife's back and recommended all kinds of positions and things to help her get some relief. I cringe at the thought of what I would have done if I had been the only one there. - What is the evidence saying about doulas?